Despite legal protections, a number of obstacles hinder civil society activists and journalists. These obstacles include pressure from government for those who speak out against it. Montenegro has participated wave of mass protests sweeping across the Western Balkans. The regional movement, dubbed the "Balkan Spring" has witnessed weekly protests held in Albania, Montenegro and Serbia calling for government reform. In Podgorica, a series of protests under the slogan “Odupri se (Resist!) – 97.000” saw thousands of citizens gather in weekly anti-government protests since early February 2019. Anti-govt protesters in Montenegro’s capital, Podgorica, have gathered in front of the country’s parliament building for tonight’s rally. There has been a wave of mass protests sweeping across the Western Balkans including in Montenegro. The regional movement, dubbed the "Balkan Spring" has witnessed weekly protests in Albania, Montenegro and Serbia calling for government reform. In Podgorica, a series of protests under the slogan “Odupri se (Resist!) 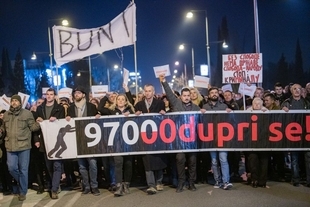 – 97.000” saw thousands of citizens gather in weekly anti-government protests since early February 2019. Chanting “Resign!” and “We are the country”, citizens, NGOs, trade unions, students, academics and doctors protested against the systematic corruption in the country and loss of human rights and media freedoms. The protests began after the legal, political and social scandal known as the "Koverta" (Envelope) affair. The protests speak to the numerous instances of corruption, smuggling, organised criminal activities and war crimes which have gone unpunished due to weak public institutions and high-level corruption. "Wake Up, Montenegro", "We’ve had enough of robbery, corruption, criminal", "Milo, prison is waiting for you", "Cowardliness, selfishness" and shouted "Milo, you thief!" Protests were organised in other cities across Montenegro in support of the Podgorica mobilisation. Rallies were also held in Herceg Novi, Budva, Nikšić, Danilovgrad, Cetinje i Pljevlja. For the most part, the protests were generally peaceful, with only minor violent incidents reported. During the fifth protest in March 2019, the police in Podgorica said that several people insulted police officers and threw stones at them. While no one was injured, the police said that they would "not tolerate violence". At the 7th #OdupriSe protest, on 30th March 2019, opposition MPs and organisers of the "Resist – 97.000" protests signed the Agreement on the Future, a document that sets out a blueprint for them to work together in order to organise "the first free and fair elections in the history of Montenegro". The agreement pledged unity in the fight against the 30-year rule of Đukanović and his ruling DPS. The “Agreement on the Future” proposes that the new unity government would comprise three parts: the opposition parties, some of the former ruling parties and independent non-party intellectuals. The CIVICUS Monitor will continue to monitor the situation of the peaceful protests in Montenegro. Since 17th January 2019, mass protests in the city of Bar took place after the commencement of building works. Eighty cypress trees were cut down and an amphitheater was demolished in the yard of the city High School to build a kindergarten. Under the slogan “Bar Pamti (Bar Remembers)”, citizens asked for the construction to be stopped and those responsible for ordering the demolition be held responsible. At one of the protests, activists blocked the entrance of the construction site, after which police briefly detained protesters inside a police van. A month later, Prime Minister Marković announced a decision to stop the construction, but protesters continued demanding a new location for the kindergarten, re-planting of the trees and prosecution of the people responsible for the destruction. Many in civil society fear the draft could be used to hide corruption in Montenegro. Civil society groups reiterated their calls to withdraw the draft and properly consult with civil society in any subsequent legislation. As covered previously on the CIVICUS Monitor, the attack of a Vijesti newspaper journalist sent shockwaves through civil society. Olivera Lakic was shot in the leg in front of her apartment in May 2018, prompting hundreds of journalists and NGO activists to protest outside the Montenegrin government building for the perpetrator to be found and brought to justice. Nine months later, Montenegrin police said they have arrested nine people in connection with the attack on journalist Lakic. Despite the arrests, the incident has opened a broader conversation in Montenegro about the physical safety of journalists. This is especially true for media workers like Lakic who work on sensitive political issues such as corruption. "Yesterday the website Antidot published an anonymous piece full of malicious misrepresentations of my professional and private life with the clear aim of devaluing my work and, presumably, forcing me to withdraw from public life." Montenegrin civil society also rallied to her defence. In a statement signed by several prominent CSO leaders, viewed the smears as part of a broader campaign to intimidate activists who question power holders in Montenegro. As previously covered on the CIVICUS Monitor, Uljarević gained prominence for her outspoken stance on the state's attempts to coerce and control independent media and civil society in Montenegro. Rules governing the formation and operation of civil society groups in Montenegro are in line with international best practice. Rules governing the formation and operation of civil society groups in Montenegro are in line with international best practice. There are no sanctions against NGOs who remain unregistered although they have no legal standing. The Law on Volunteer Work is complicated and discourages volunteers. There are many mechanisms created by government for cooperation with civil society but in reality these are rarely used. Defamation campaigns against human rights defenders are a concern. In 2014, a TV station called for the arrest of Tea Prelevic, the director of Human Rights Action, a local group working on the rights of trafficked women. Anti-corruption NGOs also report pressure from the government, while hate speech and violence have been used to target LGBTI activists. Director of the NGO LGBT Forum Progres, Stevan Milivojević, was recently verbally attacked and three men were jailed for three months each for the attack. The Constitution protects peaceful assembly and the Law on Public assembly regulates this right in practice. The Constitution protects peaceful assembly and the Law on Public assembly regulates this right in practice. Organisers of public gatherings must give the authorities five days prior notification; unannounced assemblies are not allowed and attract fines. While these provisions do not align with international best practice, CIVICUS understands that these laws are under review. Although the 2015 Pride Parade was allowed to take place in the capital Podgorica, permission was denied three times in the city of Niksic, with police citing safety concerns. Excessive force, including teargas and rubber bullets, was used on anti-government political protestors outside parliament by police in 2015 and 2016. Last year, protests were also banned in 14 towns with police saying applications were filed too late or paperwork was not complete. Under the Constitution, everyone has the right to freedom of expression with limitations on hate speech. Under the Constitution, everyone has the right to freedom of expression with limitations on hate speech. Libel was decriminalised in 2011 but defamation is still used against journalists leading to a dearth of investigative reporting. Pro-government media is accused of self-censorship and of attacking leaders of NGOs. The government is accused of occasionally withholding advertising revenue from independent media. Independent journalists face attacks and threats as well as attacks to property of independent media. A commission set up in 2013 to investigate attacks on journalists was denied access to documents and has not made any significant findings since its establishment. Reporter Tufik Softić was severely beaten in 2007 but the case was closed, although suspects were later detained in 2014. The car of investigative reporter Zorica Bulatović was damaged in an attack in May 2015 while she was investigating local corruption. Expression over the Internet in Montenegro is unhindered.